Press the youtube button to see it bigger. 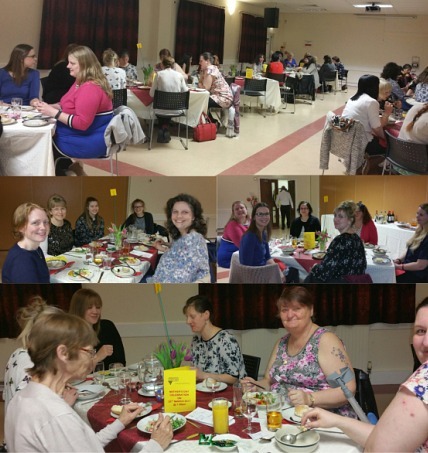 On the evening of Saturday 25th March, Abingdon Vineyard Church hosted a ‘Celebration of Mums’ for Mothers Day that was open to ladies from the church and the community in which the church serves. Fifty ladies attended this free event to enjoy a freshly cooked three course meal, with choices for each course. The food was prepared and served mainly by the men of the church. On the Sunday morning after the celebration for Mums, the church hosted its free regular monthly Vineyard Café, a community breakfast event at the Community Centre with bacon, egg and sausage rolls, tea and coffee etc are on offer to provide energy for the games and craft activities for the families. This year, the Vineyard Church is celebrating 10 years in South Abingdon. 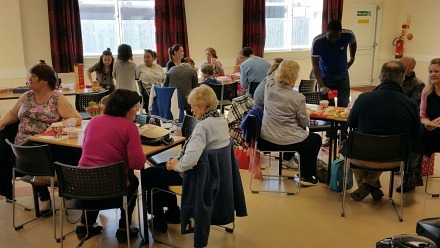 The church has met at Preston Road Community Centre throughout, from where it also runs community groups such as the Baby & Toddler Group and Youth Clubs that have been part its work in the community since the beginning. The Vineyard Church is a friendly and informal gathering of people from Abingdon and beyond where people from every background are welcome. 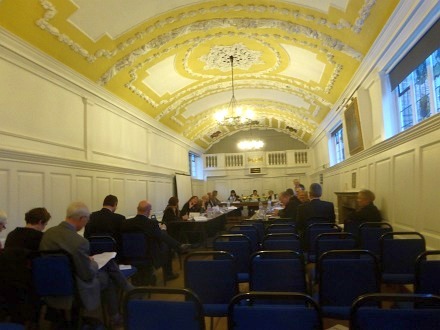 The public gallery of the Council meeting was packed at the start. There is a new custom of receiving grants directly from the Mayor, and about a dozen groups came to receive their grant cheque. After that most people left. There followed a presentation by Ian Hudspeth from the County Council on Better Oxfordshire and the aim of replacing 6 councils with ONE council. This proposal is currently being considered by the Secretary of State and a response is expected by about June. There was also some discussion round the subject of devolution of some powers to an area committee which could work closely with the Town Council. 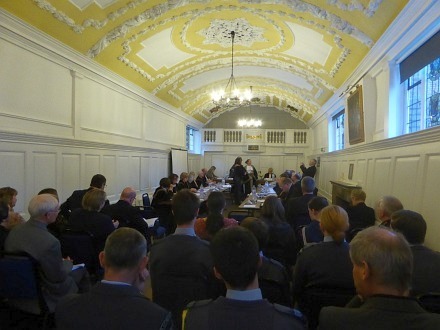 The next item on the agenda was the Community Led Plan which the Abingdon-on-Thames Town Council has been working towards. A press release has been prepared asking for people to become involved. Some people could become part of the steering committee. 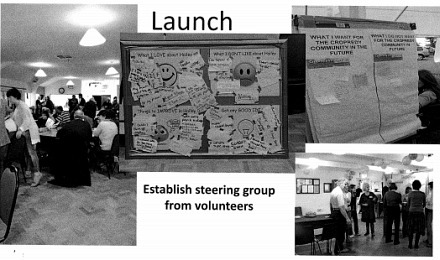 Others could get involved in working groups that look at different areas of life such as: environment, community, economy, planning, transport. The target is to get the plan completed before the next Town Council election in 2019. It was said by the person advising the council that such plans are usually undertaken by smaller places like villages. They had never undertaken a plan for such a large area as Abingdon and it would be a challenge. 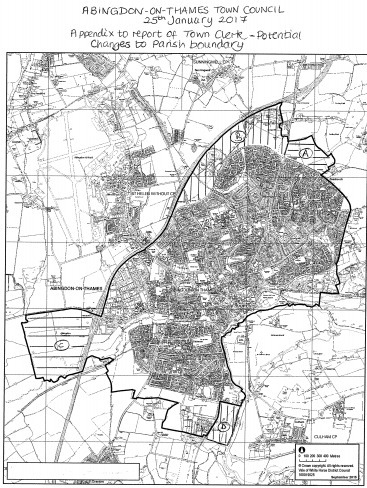 Some early suggestions about boundary changes had already been tabled and are being considered by the district council. It would see Abingdon’s boundary take in the housing developments north and south of Abingdon, and an area of Abingdon Common the other side of the A34. The next discussion was on flag poles. The council is to put three flag poles on the Market Place that community groups can hire for £50 + VAT and fly their own flag. The issue of flying a rainbow flag over the County Hall was raised, and was voted down by 9 votes to 4 with 3 abstentions. Next was the subject of the Guildhall. 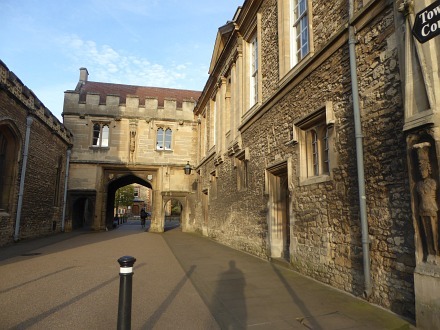 This building comprises the new Abbey Hall, and the old historic rooms. 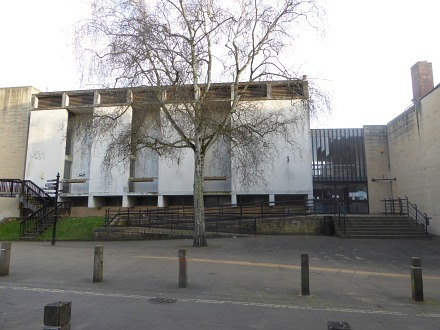 The original project, that did not go ahead because of cost, was to improve the new Abbey Hall, and make it a decent civic hall for community events. The new plan is to improve accessibility to the historic rooms by installing a lift and better walkways. The council has over £1 million, in deferred funding from the district council, that can be used on any Guildhall capital projects so it could all be used on the historic part if the council so wishes. Future plans for the Abbey Hall are not being looked at this time. This made a number of councillors upset since people expected the Abbey Hall to be redeveloped not the old part, which was refurbished five years ago. 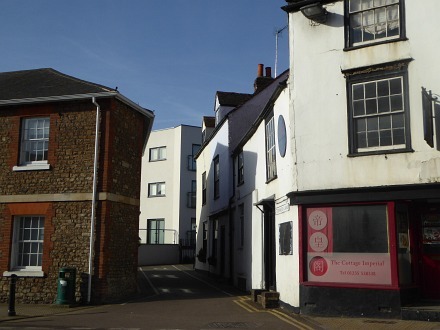 But all the Councillors voted in favour of employing consultants to start planning work on making the historic rooms accessible. 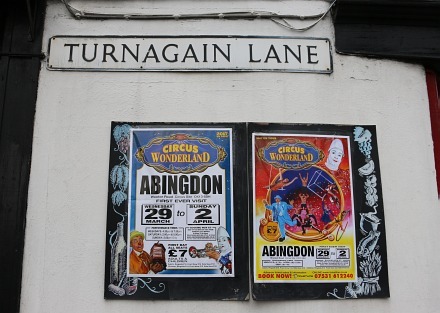 At the narrow entry to Turnagain Lane circus posters can be seen on the Cottage Imperial Blackboard. This is the first time that Circus Wonderland have been to Abingdon and they have made quite a splash with their colourful adverts. Turnagain lane was once a cul-de-sac containing small stone cottages, crammed together round a small yard. When you reached the yard you had to ‘turn again’ and go back the way you came. These days the lane ends in a view onto the white front of the Old Gaol flats. 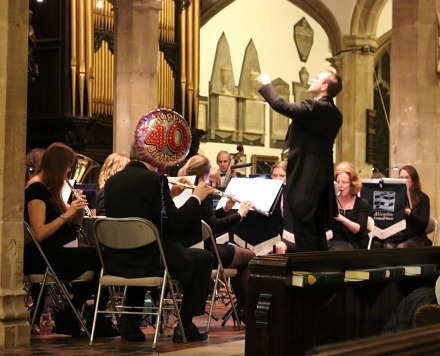 On Saturday evening, at St Helen’s Church, the Abingdon Concert Band celebrated 40 years of playing music. 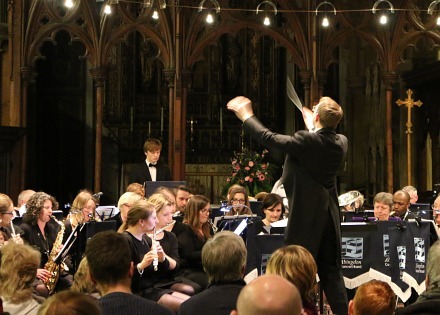 They began life in 1977 as Abingdon Military Band, and although the name has changed the formation of instruments remains the same as a modern military band. Only Alan Bolder, seen here standing and smiling, was there back at the start in 1977. For the 40th anniversary concert there was some music from 1977 such as: Star Wars, Birdland, and Hotel California. 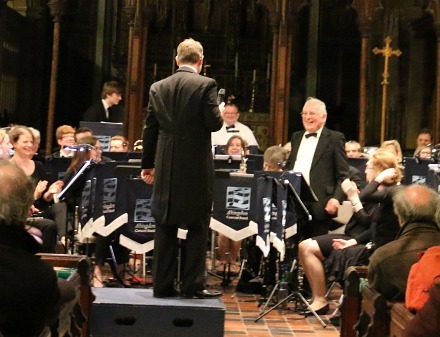 They also played music from West Side Story from 60 years ago; Sgt Peper’s Lonely Heart Club Band from 50 years ago; The Simpsons theme from 30 years ago; and Titanic,and Theme for Diana from 20 years ago. Diana, Princess of Wales, died twenty years ago! Horn of Plenty got 33 votes.